A photo of Father Marcial Maciel Degollado, founder of the Legion of Christ, circa 2004. He was revealed to have molested underage seminarians and fathered three children with two women. He died in 2008, and was never prosecuted. A lawsuit in Rhode Island brought by the niece of a wealthy, deceased widow has cracked open thousands of previously secret documents of the Legion of Christ, a disgraced Roman Catholic order of priests and young men studying to enter the priesthood. 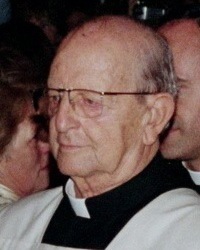 The lawsuit charges that the Legion of Christ unduly influenced a wealthy banker’s widow named Gabriel Mee, who died in 2008 at the age of 96, to alter her trust and will to bequeath $30 million to the Legion, while the Legion withheld from Ms. Mee information that the order’s founder, the Reverend Marcial Maciel Degollado, had sexually abused underage seminarians and secretly fathered three children by two women. The documents in the case were under seal until The Associated Press, the New York Times, the National Catholic Reporter and the Providence Journal petitioned the court to have them unsealed, saying they were in the public interest. A Rhode Island Superior Court judge agreed, and ordered the documents released to the public. Pope John Paul II praised and supported Rev. Maciel through the years, calling Maciel an “efficacious guide to youth,” even after 1998, when Maciel was formally accused of sexually abusing Legion seminarians. Pope Benedict, who is retiring from the papacy this month, continued the coverup until he finally pushed Maciel to retire “to a private life of penance and prayer” in May of 2006. Pope Benedict failed to involve legal authorities in the Maciel case, nor did Benedict acknowledge Maciel’s sexual transgressions or his victims. The Legion of Christ only officially acknowledged Father Maciel’s sexual transgressions on March, 25, 2010, when the order issued a formal communique’ titled, “Regarding the current circumstances of the Legion of Christ and the Regnum Christi Movement.” The Legion of Christ has branches all over the world and is still operating.